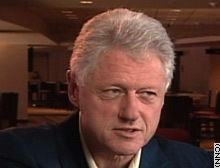 Former President Bill Clinton spoke to CNN on Monday. Do you agree with former President Clinton that government "failed" the people in the aftermath of Katrina? HOUSTON, Texas (CNN) -- Former President Bill Clinton on Monday said the government "failed" the thousands of people who lived in coastal communities devastated by Hurricane Katrina, and said a federal investigation was warranted in due time. Clinton is just the latest in a long line of critics who have blasted the federal government for not moving fast enough to help people in the immediate aftermath of Katrina, which slammed into the Gulf Coast one week ago as a Category 4 hurricane. He said that the utmost priority was saving people now -- and evaluating the mistakes in the months to come. "We've got the departments on the ground, we've got the military on the ground, we've got a chance to do it right now, and we should do it right," he said. "And then in an appropriate time we should analyze what went wrong and why and what changes should be made." As with the 9/11 commission charged with looking at the events leading up to and after the September 11, 2001 attacks, Clinton suggested a bipartisan Katrina commission be formed. It would investigate what went wrong and determine "what is the best structure and what are the best personnel decisions" to make in emergency management, he said. The elder Bush echoed Clinton's sentiment, telling CNN's Larry King that he is "not satisfied" with the handling of the hurricane's aftermath. Nonetheless, he defended his son's performance. "What can he do? He can just go out and do what he's doing today, showing that the federal government's involved, has been involved, will continue to be involved ... He cannot listen to every critic from the editorial page of The New York Times," the elder Bush said.